Yesterday evening I remembered that someone from The Cord (the WLU newspaper) had emailed with a few questions a couple of weeks ago. I kind of forgot about it, what with everything I’m forgetting about these days, but when I was answering some other interview questions last night for a CBC site on blogging, it must have twigged my memory. Hey, I thought, I wonder what that other interview was about. A quick search, and I found the paper’s “Best of Waterloo Region” poll, clicked on “Best Local Author,” and there was my own half-smiling face. What the? I had to call my kids in to check it out. The ones who were still awake and should have been in bed. I’d been helping with homework, which has been a nagging theme for these past couple of evenings. I like to help, but less so at 9:30 at night, and even less so when a project is not truly at the proofreading stage, but rather at the “I’ve made up a few facts that I think sound cool” stage. I am currently conducting late-night mini-tutorials on proper research and use of a bibliography, in between lectures on capitalization, the differences between there, their, and they’re, and have you ever heard of a comma? I’m a really patient teacher. Here’s what I wanted to show you. 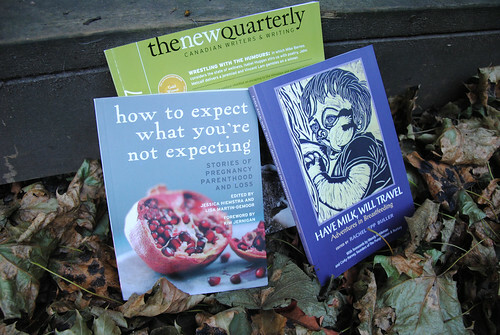 I’ve got essays in two new anthologies out this fall, plus in the summer issue of The New Quarterly. I’ll be reading from The New Quarterly piece on Saturday at Word on the Street. Find me at the Walper, 4pm. 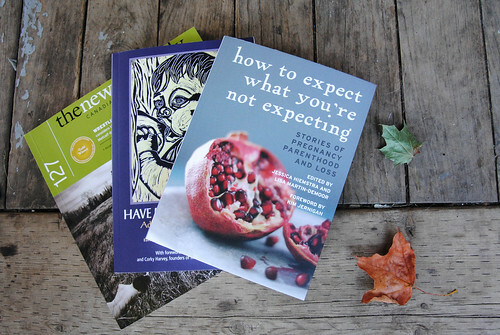 The Waterloo launch for How to Expect What You’re Not Expecting is on Oct. 3 at the Clay and Glass Gallery, 7:30pm (get in touch if you’d like to attend that one, please!). If I had the energy or wherewithal, I’d also organize a local launch for Have Milk, Will Travel, an anthology of comic stories about breastfeeding, but right now I’m overwhelmed by the every day stuff. Like vacuuming the bedroom, cleaning paint off a dog, supervising piano practice, and picking up my swim girl who is home now and eating supper, which I left on the table for her and therefore still needs to be cleared when she’s done. (Supper = fish tacos! Fish tacos = zero complaints!) I’m just pleased to be squeezing in a little necessary, happy-making blogging and book-styling before bedtime.